could you let me know if this 8 port router will be ok to use for a skymining set up ? there are some more pics on this new egg page, but it doesnt look like it has the extra port for ethernet in ? is there a work around for that such as a double connector or something ? i also noticed this and was curious if it would be suitable ? 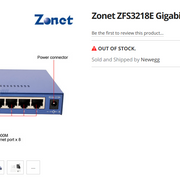 but once again it doesnt seem to have the extra input port for the the ethernet cable ? You guys must be carefull when you talk about the components you are referring to. Are you looking for SWITCHES or ROUTERS? They are definitely NOT the same. Depending on what you are talking about, the one may have ethernet port(s) or not! i will make a photo blog / vid about the build so new peeps can learn from it.. Still i have some questions does someone know if the TL-WR1043ND - version 2.1 is good for the skywire? Thanks for this! Is there any good step-by-step guide based on this component list? (05-20-2018, 10:14 AM)majol Wrote: Thanks for this! Is there any good step-by-step guide based on this component list? At the website of openwrt, (https://wiki.openwrt.org/toh/start), only firmware for version 1.0, 1.1 and 2.0 is available. What should I do to get OpenWrt running on my Archer C7 v4.0? Can anyone answer this? I have the same just the US version v4. Seems dd-wrt has it figured out, I just don't know if I can use that over openwrt.